Did I Mention I Have Cats and I Knit? 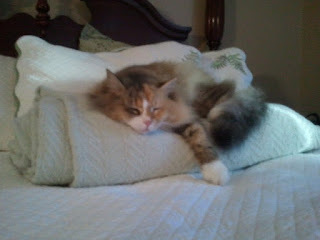 "Hey, Mr. Grumpbump, call your cat", these were the words I used tonight as Delilah scurried through the living room. He whistles for her a few times and she scurries towards him. Delilah walks around this house as if she bought and paid for it several times over. Her tail is always straight up in the air and she carries herself with absolute confidence. She makes herself comfortable wherever she feels like. Compare that to Miss Macy, who stays out of the way, hugs the corners of the living room, and rarely makes a sound. Macy doesn't travel far to settle down; she's either in the cat tree in the front room or squeezing into the shoebox left behind by guests. Our little family gets quirkier and weirder each day but that's not a negative. I think it brings us closer - we know how weird we must seem to the outside world. I've been knitting small projects here and there.